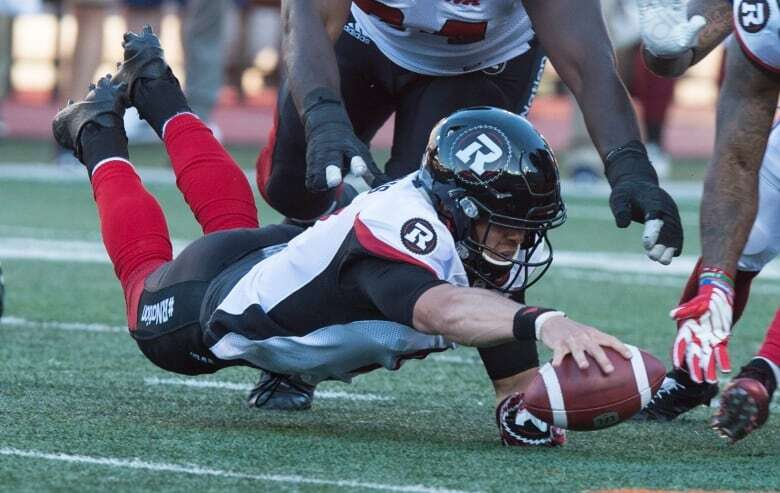 Trevor Harris threw touchdown passes to Ernest Jackson, Greg Ellingson and Chris Williams as the Ottawa Redblacks continued their mastery over the Montreal Alouettes with a 28-13 victory on Thursday. The rivalry between Montreal and Ottawa is heating up and the Redblacks currently have the upper hand. Trevor Harris, making his first start in place of the injured Henry Burris, passed for 395 yards and threw touchdowns to Ernest Jackson, Greg Ellingson and Chris Williams as the Redblacks defeated the Alouettes 28-13 on Thursday. But all the post-game talk was about an incident at 7:35 of the third quarter when Alouettes receiver Duron Carter and Redblacks defensive back Jerrell Gavins were ejected after a wild melee at the Ottawa bench. Carter was hammered as he made a spectacular catch in the end zone. After that, he walked by Ottawa's bench and bumped into head coach Rick Campbell, knocking him over. The Redblacks rushed to Campbell's defence, throwing slaps and shots at Carter, who continued his celebration straight through the Ottawa bench area to his own bench, which is on the same side of the field. "To tell the truth, I don't even know what happened," said Carter, who returned to Montreal after a year in the NFL. "I ran into the coach, apparently," he continued. "I didn't even know I knocked him over. It's an emotional game. I'm excited. I got hit. I got a cut on my face from that hit. You tell me." Now the CFL will decide whether there will be suspensions. "He gave me a decent shoulder," said Campbell. "I mean he came in," he added. "I know he's a very good player and all that stuff but obviously we don't need stuff like that to happen," Campbell said. "And it's a league rule that you're not supposed to be talking or walking through the other bench or near the other bench." The incident distracted attention from a second straight strong performance and a second road win to start to season for Ottawa. After the melee, the game was put away by the Redblacks with a pair of Chris Milo field goals and a 52-yard touchdown catch by a wide open Williams at 8:53 of the fourth quarter. Williams had seven catches for 187 yards. Boris Bede had a field goal for Montreal (1-1) in front of 21,522 fans at Percival Molson Stadium. Kevin Glenn completed 26 passes for 259 yards — nine of them to Nik Lewis for 114 yards. Travon Van ran wild as the Redblacks built a 14-5 halftime lead, gaining 86 yards on 12 carries and paving the way for two touchdown throws, before the running back left with what Campbell called a minor injury. After the teams exchanged singles in the opening quarter, Bede missed a 36-yard field-goal attempt to give Montreal a brief 2-1 lead. Harris then led a six-play drive capped by an eight-yard toss to Jackson before a two-point conversion attempt failed. Moments later, Harris threw on the run to Ellingson for a 13-yard touchdown and Milo kicked a successful convert. Bede was good from 53 yards on the final play of the half for Montreal. Montreal receiver S.J. Green left in the first quarter with a right knee injury and did not return. Ottawa linebacker Olivier Goulet-Veilleux was wheeled off in the second quarter after he appeared to jam a knee or ankle while joining in a special teams tackle. Campbell said he broke a leg and will be out long-term. Burris ended a streak of 73 consecutive games started. He is out six weeks with a broken finger.